When Kristina Helfer first met Tito four months ago, she was nearly in tears. 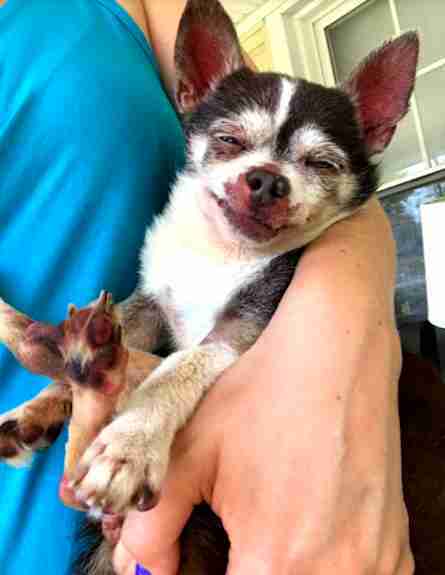 The 16-year-old Chihuahua was blind. He could hardly breathe and couldn’t move his back legs. He had an infected mass on his back end and was constantly wheezing. 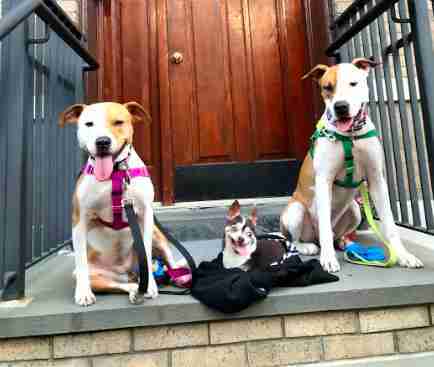 His owner unfortunately fell sick and family members were unable to care for him, so he was brought to a shelter in New York City. As bad off as Tito seemed, Helfer knew she had to get him help. 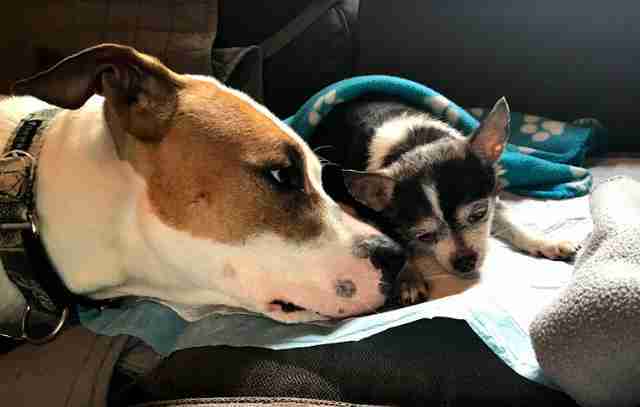 A veterinarian laid out a medical plan for Tito, and Helfer took him home to get him comfortable and start medication for a collapsed trachea. And that’s when Tito met Frank. Helfer adopted 2-year-old Frank last August after he was discovered in a junkyard completely emaciated and covered in mange. He was a spitting image of Helfer’s other pit bull, Piper, who was rescued in a similar condition. 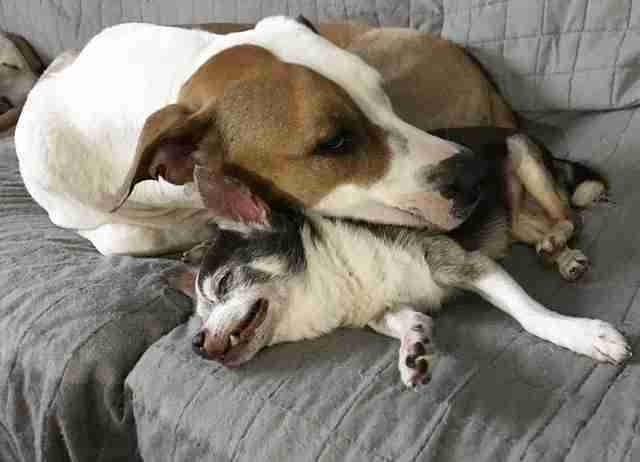 Frank has anxiety and sometimes still struggles with it — but the one thing that he can always count on is the comfort he gets from taking care of others. 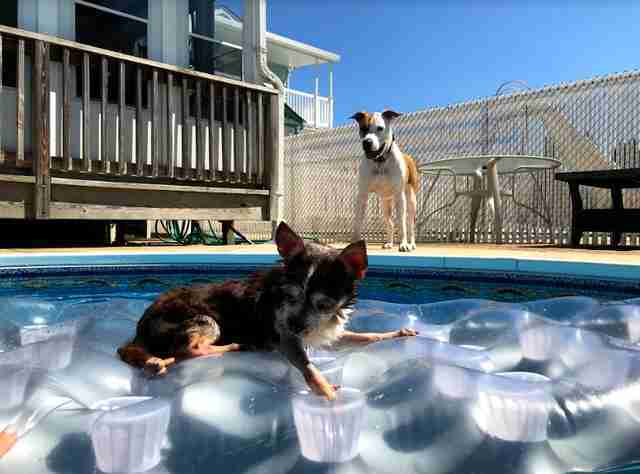 Tito was no exception — and Frank rarely left his side. 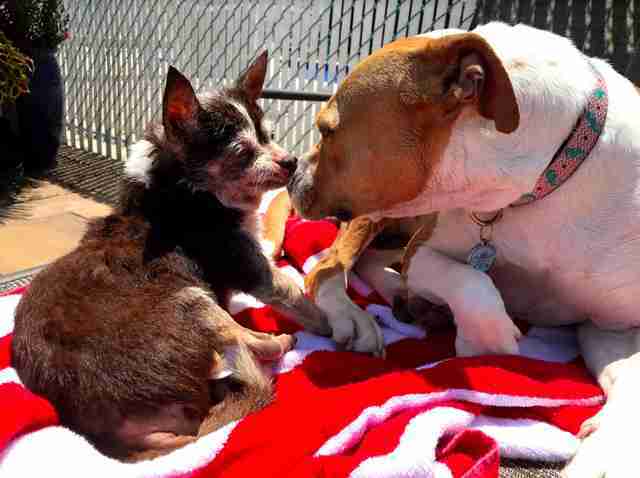 But Helfer could tell the two were forming a bond deeper than Frank shared with any of the other dogs. Thankfully, after a few days of rest and medication, Tito’s breathing started to improve. It wasn’t long before he made a full recovery from his breathing issue, and was healthy enough to go in for surgery to get neutered and remove the mass. 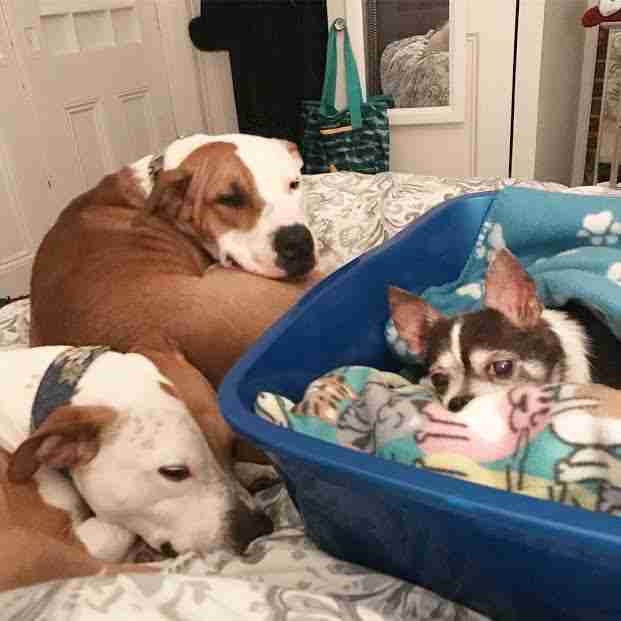 Tito’s health care was fully covered through Lola’s Legacy, a program through Wise Animal Rescue that sponsors senior dogs’ care in order to place them into forever homes. And after seeing how bonded Frank and Tito had become, that home officially became Helfer’s. 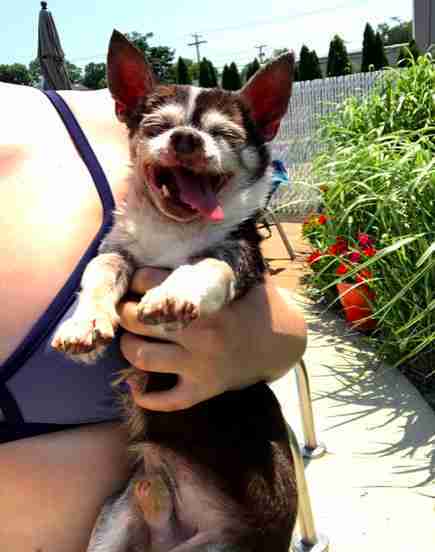 While Tito can’t see or walk, he doesn’t let it stop him from taking in all the joys of life. He absolutely loves being outside and lying by the pool. 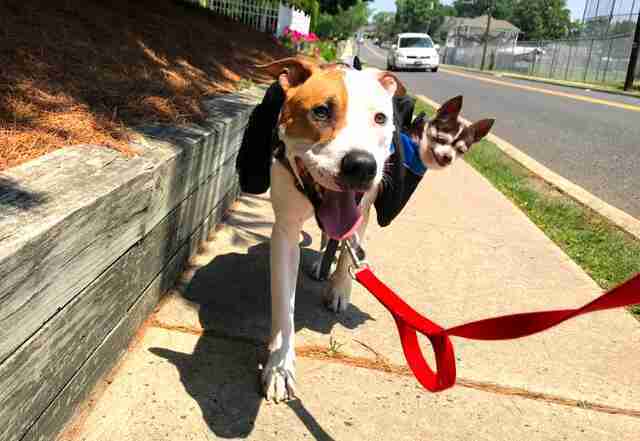 With Frank’s help, he even goes on walks — nestled comfortably in a little side pack on his friend’s body. When they’re not going on walks or lounging by the pool, the kindred pair simply like relaxing and eating snacks. 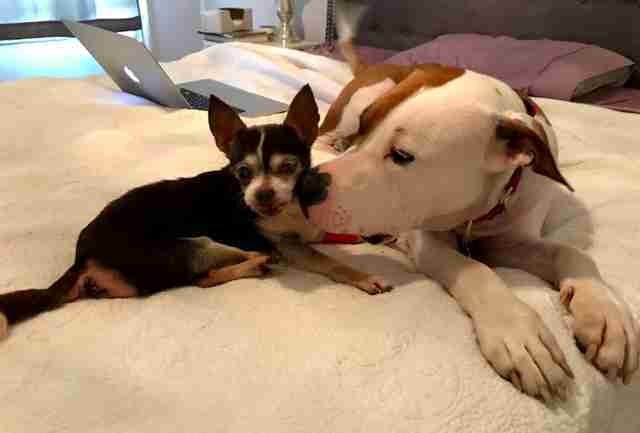 As long as Tito and Frank are together, they’re having a blast. Although it’s unclear exactly what Tito’s life was like before, one thing is certain. With a new mom and two wonderful friends by his side, his 16th year is set to be his sweetest yet. 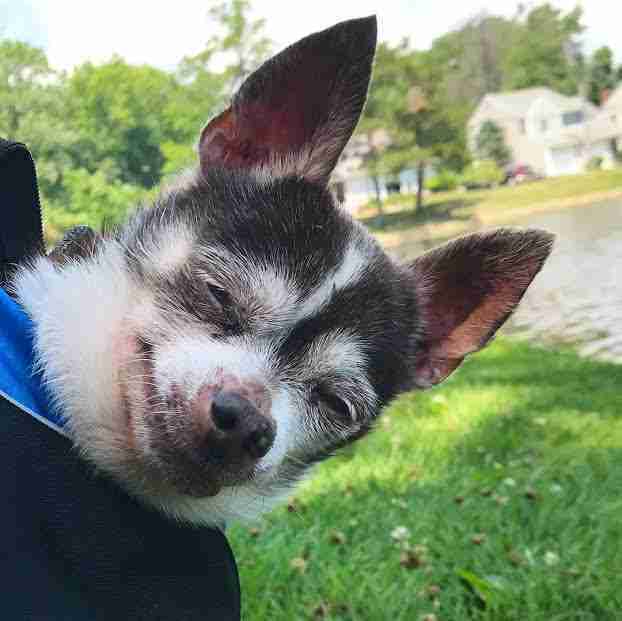 To help more senior dogs like Tito find their forever home, you can make a donation to the Wise Animal Rescue Lola’s Legacy fund. If you’re interested in fostering or adopting a dog through the program, you can find more information here.